The facet joints break down from aging, wear and tear, injury, instability, and slipping of the spine called spondylolithesis. This wearing out of the facet joints is called degeneration. These degenerative changes may produce back pain. Facet arthropathy is commonly referred to as arthritis of the facet joint. Most common cause of facet arthritis is osteoarthritis. “Osteo” means bone and arthritis means inflammation of joints. Osteoarthritis causes the breakdown and swelling in the cartilage of the facet joint ultimately producing bone on bone rubbing. The body tries to stop this rubbing by thickening the joint. Arthritis of the facet joints may produce pain and stiffness. If the joints enlarge too much, they may pinch nerves causing arm or leg pain. At Executive Spine Surgery, our spine doctors offer a variety of treatment options to patients throughout Hackettstown and Newton who are suffering from facet arthritis and back pain. To determine the painful structure the patient may undergo pain mapping. Facet injections are used to localize where the pain is coming from. 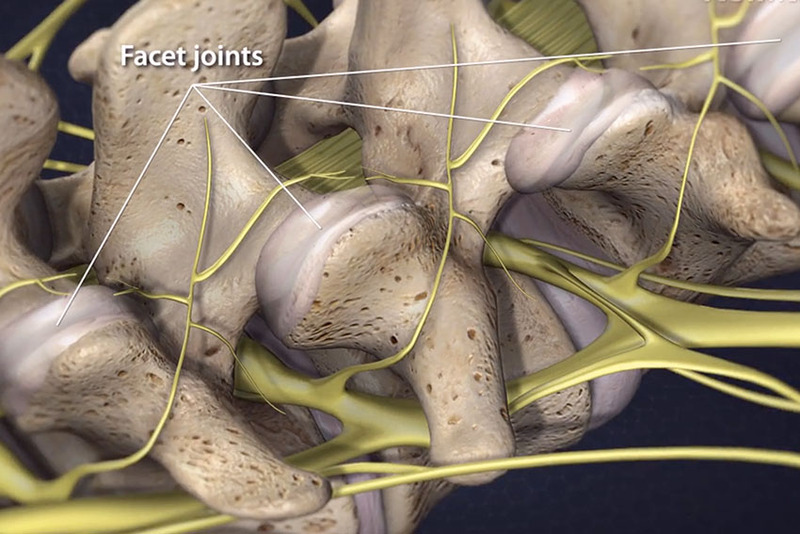 Numbing medicine is injected into the facet joint or onto the facet nerve (medial branch nerve). If the pain is caused by the facet joint the pain will stop or decrease. If the pain does not improve then the pain is not from the facet joint, but is originating from something else, such as the bones, disks, ligaments, spinal nerves, etc. Patients who fail conservative facet arthritis treatment may benefit from surgical treatment at our Hackettstown or Newton clinic. Traditionally these patients were treated with either a large fusion surgery or radiofrequency ablation (RFA). RFA is the placement of burning electrodes blindly onto the spine under x-ray guidance to burn medial branch nerves that transmit back pain. The nerves usually recover from the injury after 6 to 9 months and the pain returns. Endoscopic Rhizotomy is a new improved treatment for back pain. The medial branch nerves are found and cut under direct visualization through the endoscope. Patients usually have almost immediate pain relief lasting for years. Recovery time ranges from one to three weeks. For facet arthritis and back pain treatment options in Hackettstown and Newton, call Executive Spine Surgery to schedule an appointment with our experienced spine doctor.